The Dexcom G4 Platinum Adult CGM Receiver With Share Black, model #STKRR001P, provides dynamic glucose information by showing where glucose is, where it’s going, and how fast it’s getting there. Trend arrows and Rate-of-Change Alerts - Catch highs and lows before they happen. Easy Calibration - 2 calibrations/day for optimal accuracy. Touch of a Button - One press shows where glucose is, where it's going, and how fast it's getting there. Customized Alerts - Customized tones and melodies and a hypo alarm set at 55mg/dL. Now with remote monitoring capability - Bluetooth wireless communication built in. Color CGM Trends - Easy to read: yellow for high, red for low, white for good to go. Sensor - Tiny sensor wire for easy comfortable 7-day wear. 20-Feet Transmission - More flexibility for your active lifestyle. 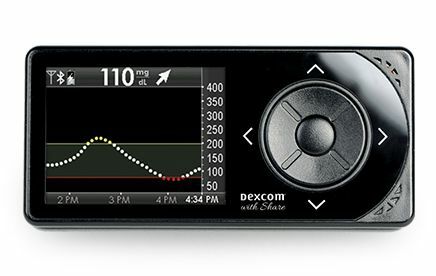 The all-new Dexcom G4 PLATINUM Adult CGM Receiver with Share features BLE (Bluetooth Low Energy) wireless communication built into the receiver, enabling remote monitoring capabilities. Through secure wireless connections, the Dexcom G4 PLATINUM Adult CGM Receiver with Share allows remote viewing of glucose levels, trends and data between the person with diabetes and their spouse, grandparent or other loved ones from an Apple iPhone or iPod touch. Sharing is caring, so whether you're in college, you live in another state, or you're going on a business trip, the Dexcom G4 PLATINUM Adult CGM Receiver with Share is there to keep you and your loved ones connected and informed. We are unable to accept returns for Dexcom products.